Welcome to Arrowsocks - custom arrow creations! One of the most used search terms on our site is "How To Measure" - so we've made it it's own page! On our adverts, there's normally a "Size" drop down box for you to choose. We have on file, nearly all main stream shaft sizes - so it is always best, if you can, to simply give us the make, model and spone of your arrows. E.g. Easton, ACC, 3-04. We can then work out the exact size you need and you can select the CUSTOM option in size. There will be a text box below it for you to enter the details into. If you're one of the few who have obscure arrows we dont have on file - or you simply want to measure them anyway - please see the graphic below which give you a couple of methods. Method 1 is the most un-scientific but will work, Method 2 is best if you have access to Vernier Claipers. 1) We take pride in our work and want the wraps to fit your arrows perfectly, not have huge overlaps or risk a gap. The wraps will naturally shrink over time - hence the 2mm overlap we include to counter this. 2) If you would like spin wing lines on your wraps - we need to know how to space them, without knowing the diameter of your arrow, we cannot do this accuratly. 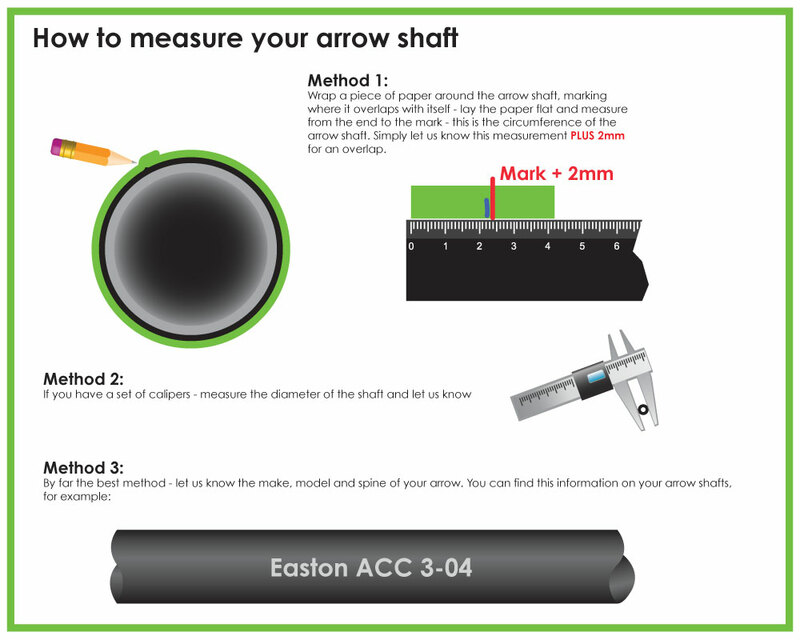 Barrelled shafts - Easton X10 for instance is fatter in the middle than the front and back, Protours, ACE etc are fatter at the nock end - when measuring and especially on these shafts - measure at the nock end, not the middle. Still unsure? - Pop us a message through one of our contact forms and we'll happily help you.